Our world is full of wonders. Everyday we saw many wonders occurring in our environment. But there are some specific places which are known as Seven Wonders of the World. 1) The Pyramids of Egypt. The pyramids of Egypt is the oldest of seven ancient wonders of the world the pyramids are the only ancient wonders still standing toda. About 138 pyramids are discovered till today. The largest and most famous pyramid is named as pyramid of khufu it covers about 13 acres and it contains more than 2 million stone blocks that weight from two to 30 tons each. Geologists guess that these pyramids were built in 2561 BC. These pyramids were built in such age when no machinery were invented, huge block of stones lifted by only man force. The statue of Zeus was built in the ancient town of Olympia by Greeks about 457 BC .It was built in the honor of God Zeus by Greek sculpture Phidias. The material used to built this statue was wooden frame which is covered with ivory and gold panels. The statue was about 42 feet high and its width was about 18 feet.In 1303 the temple in which statue of zeus located destroyed due to earthquake. Greeks considered Zeus the father of gods. This lighthouse is one of the most known wonder of ancient world .It was built by Sostratus of Cnidus about 280 BC .Its height was about 110 meters. It contains three floors of different shape and different measurements. First floor was square shape second floor was octagonal shaped and third floor had cylindrical shape. This was used to locate ships from hundred of miles away. It was also used to indicate boats and ships for entrance to port . The mot wonder things of this light house is its height its different shaped floors and its high strength with which it resist the high pressure sea winds. It was destroyed in 1303 BC. due to earth quake. This was located at the island named Rhodes. This statue was made by famous sculptor named Chars of Lindos about 305 BC. This statue was made up of bronze. This statue was built to represent the victory of Rhodiens against the Macedonian . This statue was about 180 feet high and its width is about 46 feet. this statue was built in honor of Helios the Greek sun god. this was destroyed in 226 BC. The sixth wonder of world is known as Temple of Artemis. It was located in middle of Ephesus in 550 BC . The construction of this temple was funded by king of Lydia named Croesus. The main purpose for constructing this temple is for worship.People of Ephesus also used this place as market.In the middle of temple statue of Goddess was present this statue is made up of marble , for decoration marble body of statue was covered by ivory and gold leafs. In 7th century the building of temple was badly effected by flood. It was rebuilt in 550 BC. In 260 AD the whole building of temple was destroyed by earthquake. 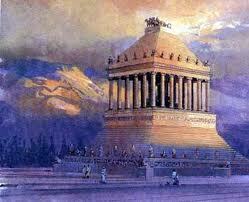 last but not the least is Mausoleum at Halicarnassus.